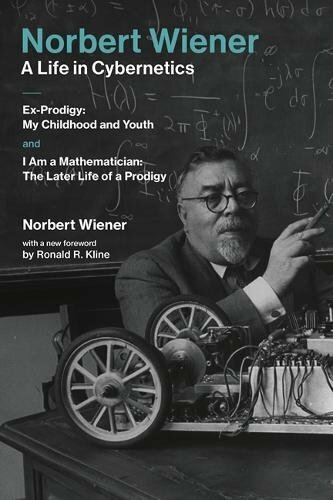 This autobiography combines two volumes by electrical engineering/computing pioneer Norbert Wiener 'Ex-prodigy: my childhood and youth' and 'I am a mathematician: the later life of a prodigy'... and it is profoundly hard going. The first volume takes us from Wiener's birth to adulthood, though by this time he had experienced more than most as he went to university aged 11. The descriptions of life and goings on in general are distinctly dull to a modern eye. Occasionally things liven up a little, for example when he describes the suffering of a fellow child-prodigy in later life, or talks about his experience at Cambridge (the real one) with Bertrand Russell. However, there's a lot that is either of little interest or has lost its context with time. So, for example, we are told that 'I have had no contact with Berle [a contemporary child prodigy at Harvard] since his graduation. He became one of that group of young lawyers and statesmen sponsored by Felix Frankfurter, a group that has been a fertile source of talent…' You have to have been there. No doubt 'that group' meant something to a certain clique once, but they do no longer. Eventually, after several hundred pages we do get to the bit the Wiener is famous for - cybernetics, which after the Second World War briefly flourished as a kind of cross-disciplinary approach to control systems that had strong overlaps with early computing, but seems to have largely faded away as unnecessary intellectual posturing since. There's no doubt that elements were incorporated into engineering, IT and robotics, but now it is little more than an odd word. I would only bother with this book if the reader were a historian of science and technology, writing something about Wiener or the rise and fall of cybernetics as a concept. For such an audience it deserves three stars. But (as the pricing suggests) it's not for the rest of us.